$1,594 off MSRP! Corolla LE 4D Sedan 1.8L I4 DOHC 16V FWD CVT Classic Silver Metallic 6 Speakers, Automatic temperature control, Brake assist, Dual front impact airbags, Emergency communication system: Safety Connect, Exterior Parking Camera Rear, Front anti-roll bar, Fully automatic headlights, Heated door mirrors, Illuminated entry, Premium Fabric Seat Trim, Radio: AM/FM w/6 Speakers & Navigation, Remote keyless entry, Security system, Speed-sensing steering, Traction control. 30/38 City/Highway MPG Stop by Peoria Toyota today at 7401 N Allen Rd, Peoria, IL 61614 to schedule a test drive or give us a call at 309-693-7000 to make an appointment. To view all available inventory please visit www.peoriatoyota.com. Recent Arrival! $1,252 off MSRP! Corolla SE 4D Sedan 2.0L I4 DOHC 16V FWD CVT Classic Silver Metallic 6 Speakers, All-Weather Floor Liners, Automatic temperature control, Brake assist, Distance pacing cruise control: Full-Speed Range Dynamic Radar Cruise Control (DRCC), Dual front impact airbags, Emergency communication system: Safety Connect, Exterior Parking Camera Rear, Front anti-roll bar, Fully automatic headlights, Heated door mirrors, Illuminated entry, Premium Fabric Seat Trim, Radio: AM/FM w/6 Speakers & Navigation, Remote keyless entry, Security system, Speed-sensing steering, Traction control. 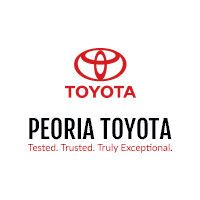 31/40 City/Highway MPG Stop by Peoria Toyota today at 7401 N Allen Rd, Peoria, IL 61614 to schedule a test drive or give us a call at 309-693-7000 to make an appointment. To view all available inventory please visit www.peoriatoyota.com. Recent Arrival! $1,385 off MSRP! Corolla XLE 4D Sedan 1.8L I4 DOHC 16V FWD CVT Black Sand Pearl 6 Speakers, All-Weather Floor Liners, AM/FM radio: SiriusXM, Automatic temperature control, Blind spot sensor: Blind Spot Monitor (BSM) warning, Brake assist, Distance pacing cruise control: Full-Speed Range Dynamic Radar Cruise Control (DRCC), Dual front impact airbags, Emergency communication system: Safety Connect, Exterior Parking Camera Rear, Front anti-roll bar, Fully automatic headlights, Heated door mirrors, Heated Front Bucket Seats, Illuminated entry, Power moonroof, Radio: AM/FM/CD Player w/Navigation, Remote keyless entry, Security system, SofTex Leather Seat Trim, Speed-sensing steering, Traction control. 29/37 City/Highway MPG Stop by Peoria Toyota today at 7401 N Allen Rd, Peoria, IL 61614 to schedule a test drive or give us a call at 309-693-7000 to make an appointment. To view all available inventory please visit www.peoriatoyota.com.